Sri Lankan rebels have asked Norwegian peace brokers to pressurise the government to end violence near the country's most revered Catholic shrine. The rebels say the army has been shelling the church compound in Madhu in Tamil Tiger-controlled territory near the frontline in the fighting. But the army blames the Tigers for taking up positions in the area. A statue of the Virgin Mary, which is said to have miraculous properties, was removed for its safety last week. It is the first time in decades of civil war that the statue has been moved from the site - a sign of how bad things have got. 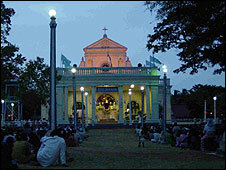 The Madhu church is revered by Sri Lankans of all religions, although it is a Catholic shrine. Buddhists, Hindus and Protestants all visit the area in their tens of thousands on pilgrimage - when there is peace. It is also a rare symbol of ethnic unity, cutting across differences between Sinhalese and Tamils. 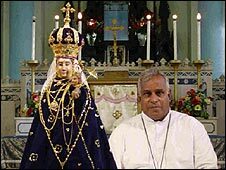 The faithful believe that the statue of the Virgin Mary, known as Our Lady of Madhu, has healing and protective properties. The soil of the compound is supposed to cure poisonous snake bites. Designated a peace zone, Madhu Church has often sheltered refugees. More than 20,000 civilians were sheltering in the Madhu area, but as the fighting worsened recently they fled further north, and for the first time the statue of Our Lady of Madhu also had to leave the church. The Tigers have now written to Norway's International Development Minister Erik Solheim, who was the top peace envoy in Norwegian-backed talks that failed. The rebels complained that the Sri Lankan military has fired multi-barrel rocket launchers, artillery and mortar against the holy site for the last few weeks. The Tigers say one of the churches in the compound has already been damaged. But the Sri Lankan army has blamed the Tigers - saying they placed mortar guns around the church and fired at them.